"£1" redirects here. For other uses, see List of £1. The original, round £1 coin replaced the Bank of England £1 note, which ceased to be issued at the end of 1984 and was removed from circulation on 11 March 1988, though still redeemable at the Bank's offices, like all English banknotes. One-pound notes continue to be issued in Jersey, Guernsey and the Isle of Man, and by the Royal Bank of Scotland, but the pound coin is much more widely used. A new, dodecagonal (12-sided) design of coin was introduced on 28 March 2017  and both new and old versions of the one pound coin circulated together until the older design was withdrawn from circulation on 15 October 2017. After that date, the older coin could only be redeemed at banks, although some retailers announced they would continue to accept it for a limited time. The round pound remains legal tender on the Isle of Man. The main purpose of redesigning the coin was to combat counterfeiting. As of March 2014 there were an estimated 1,553 million of the original nickel-brass coins in circulation, of which the Royal Mint estimated in 2014 that just over 3% were counterfeit. The new coin, in contrast, is bimetallic like the current £2 coin, and features an undisclosed hidden security feature called "iSIS" (Integrated Secure Identification Systems). To date, four different portraits of Elizabeth II have appeared on the obverse. For the first three of these, the inscription was ELIZABETH II D.G.REG.F.D. 2013, where 2013 is replaced by the year of minting. The fourth design, unveiled in March 2015, expanded the inscription slightly to ELIZABETH II DEI.GRA.REG.FID.DEF. 2015. 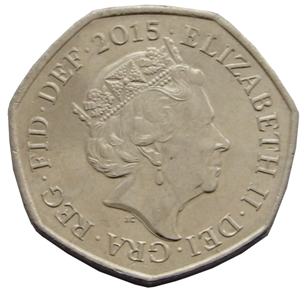 The 12-sided design, introduced in March 2017, reverted to 2017 ELIZABETH II D.G.REG.F.D. In 1983 and 1984 the portrait of Queen Elizabeth II by Arnold Machin appeared on the obverse, in which the Queen wears the "Girls of Great Britain and Ireland" Tiara. Between 1998 and 2015 the portrait by Ian Rank-Broadley was used, again featuring the tiara, with a signature-mark IRB below the portrait. In 2015 the portrait by Jody Clark was introduced, in which the Queen wears the George IV State Diadem, with a signature-mark JC below the portrait. In August 2005 the Royal Mint launched a competition to find new reverse designs for all circulating coins apart from the £2 coin. The winner, announced in April 2008, was Matthew Dent, whose designs were gradually introduced into the circulating British coinage from mid-2008. The designs for the 1p, 2p, 5p, 10p, 20p and 50p coins depict sections of the Royal Shield that form the whole shield when placed together. The shield in its entirety was featured on the £1 coin. The coin's obverse remained unchanged. The design of the reverse of the original coin was changed each year from 1983 to 2008 to show, in turn, an emblem representing the UK, Scotland, Wales, Northern Ireland, and England, together with an appropriate edge inscription. This edge inscription could frequently be "upside-down" (when obverse is facing upward). From 2008, national-based designs were still minted, but alongside the new standard version and no longer in strict rotation. The inscription ONE POUND appeared on all reverse designs. In common with non-commemorative £2 coins, the round £1 coin (except 2004–07 and the 2010–11 "capital cities" designs) had a mint mark: a small crosslet found on the milled edge that represents Llantrisant in South Wales, where the Royal Mint has been based since 1968. The reverse of the new 12-sided, bimetallic pound coin, introduced on 28 March 2017, was chosen by a public design competition. The competition to design the reverse of this coin was opened in September 2014. It was won in March 2015 by 15-year-old David Pearce from Walsall, and unveiled by Chancellor George Osborne during his Budget announcement. The design features a rose, leek, thistle and shamrock bound by a crown. All years except 1998 and 1999 have been issued into circulation, although the number issued has varied enormously – 1983, 1984 and 1985 in particular had large mintages to facilitate the changeover from paper notes, while some years such as 1988 are only rarely seen (although 1988 is more noticeable as it has a unique reverse). Production since 1997 has been reduced, thanks to the introduction of the circulating two pound coin. The final round coins minted for 2016 and the 2015 Shield of the Royal Arms 5th portrait did not enter circulation, as they were only available through commemorative sets. These were the shield from the Royal Coat of Arms by Matthew Dent, and a design by Gregory Cameron, Bishop of St Asaph, of four heraldic beasts. During later years of the round pound's use, Royal Mint surveys estimated the proportion of counterfeit £1 coins in circulation. This was estimated at 3.04% in 2013, a rise from 2.74%. The figure previously announced in 2012 was 2.86%, following the prolonged rise from 0.92% in 2002–2003 to 0.98% in 2004, 1.26% in 2005, 1.69% in 2006, 2.06% in 2007, 2.58% in 2008, 2.65% in 2009, 3.07% in 2010 and 3.09% in 2011. Figures were generally reported in the following year; in 2008 (as reported in 2009), the highest levels of counterfeits were in Northern Ireland (3.6%) and the South East and London (2.97%), with the lowest being in Northwest England. Coin testing companies estimated in 2009 that the actual figure was about twice the Mint's estimate, suggesting that the Mint was underplaying the figures so as not to undermine confidence in the coin. It is illegal to pass on counterfeit currency knowingly; the official advice is to hand it in, with details of where received, to the police, who will retain it and investigate. One article suggested "given that fake coins are worthless, you will almost certainly be better off not even looking". The recipient also has recourse against the supplier in such cases. Counterfeits are put into circulation by dishonest people, then circulated inadvertently by others who are unaware; in many cases banks do not check, and circulate counterfeits. A 2011 the BBC television programme Fake Britain withdrew 1,000 £1 coins from each of five major banks and found that each batch contained between 32 and 38 counterfeits; the Mint estimated that about 31 per 1,000 £1 coins were counterfeit. Some of the counterfeits were found by automated machinery, others could be detected only by expert visual inspection. In July 2010, following speculation that the Royal Mint would have to consider replacing £1 coins with a new design because of the fakes, bookmakers Paddy Power offered odds of 6/4 (bet £4 to win £6, plus the £4 stake back; decimal odds of 2.5), that the £1 coin would be removed from circulation. Some counterfeits were of poor quality, with obviously visible differences (less sharply defined, lacking intricate details, edge milling and markings visibly wrong). Many better counterfeits can be detected by comparing the orientation of the obverse and reverse—they should match in genuine modern UK coins, but very often did not in counterfeit round £1. The design on the reverse must be correct for the stamped year (e.g., a 1996 coin should have a Celtic cross). It was difficult to manufacture round pounds with properly-produced edges; the milling (grooves) was often incomplete or poor and the inscription (often "DECUS ET TUTAMEN") sometimes poorly produced or in the wrong typeface. A shiny coin with less wear than its date suggests is also suspect, although it may be a genuine coin that has rarely been used. Counterfeit coins are made by different processes including casting, stamping, electrotyping, and copying with a pantograph or spark erosion. In a 2009 survey, 99% of fake £1 coins found in cash centres were made of a nickel-brass, of which three fifths contained some lead and a fifth were of a very similar alloy to that used by the Royal Mint. The remaining 1% were made of simple copper-zinc brass, or lead or tin, or both. Those made of lead or tin may have a gold-coloured coating; counterfeits made of acrylic plastic containing metal powder to increase weight were occasionally found. The final 'round pounds' were minted in December 2015; the replacement, a new 12-sided design, was introduced in 2017, the earliest dated as 2016. The coin has a 12-edged shape, similar to the pre-decimal brass threepence coin; it has roughly the same size as the previous £1 coin, and is bi-metallic like most £2 coins. The new design is intended to make counterfeiting more difficult, and also has an undisclosed hidden security feature called "iSIS" (Integrated Secure Identification Systems), thought to be a code embedded in the top layer of metal on the obverse of the coin, visible only under a specific wavelength of ultraviolet light. Current two-pound coins, being bi-metallic (excluding some rarely tendered commemorative issues), remain harder to counterfeit than the round pound was; such counterfeits would often easily seen to have wrong colour(s). While the round pound was operational, others that entered circulation, although not legal tender, in the UK were some £1 coins of British Crown Dependencies, Gibraltar and UK South Atlantic Overseas Territories. Most coins of these territories, in all denominations, were of the same size and composition as a UK equivalent and most bore the same portraits of the UK monarch. None of these territories rushed to replace their round pound coins except Gibraltar after the UK did so, which continues to use Gibraltarian pound coins as legal tender as well as the new UK pound coins. In an April 1993 The New Yorker article "Real Britannia", Julian Barnes describes the meetings to choose the 1994–1997 reverse designs. This is reprinted in his book Letters from London as "Britannia's New Bra Size". ^ "No. 39873". The London Gazette (11th supplement). 26 May 1953. p. 3023. Proclamation of 28 May 1953 made in accordance with the Royal Titles Act 1953. ^ "Project Britain-British Coins". 2013. Retrieved 27 October 2016. ^ "One Pound Coin". Royal Mint. Retrieved 22 November 2016. ^ a b "New 12-sided pound coin to enter circulation in March". BBC News. 1 January 2017. Retrieved 2 January 2017. ^ Giedroyc, Richard (23 May 2017). "'Most secure coin in world' launched". numismaticsnews.net. Retrieved 24 May 2017. ^ "Race on to spend old £1 coins as deadline looms". BBC News. 13 October 2017. Retrieved 14 October 2017. ^ "Manx round pound coins to remain 'legal tender'". BBC News. 7 February 2017. Retrieved 6 October 2017. ^ a b "£1 Counterfeit Coins". royalmint.com. Retrieved 1 September 2014. ^ a b "How can I spot a fake £1 coin?". London: The Telegraph. 19 March 2014. ^ "New pound coin: Firms told to prepare for redesign". BBC News. 31 October 2016. Retrieved 31 October 2016. ^ "Specification of the £1 coin: a technical consultation" (PDF). HM Treasury. September 2014. ^ Clayton, Tony. "Decimal Coins of the UK – One Pound". 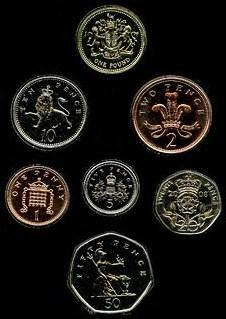 coins-of-the-uk.co.uk. Retrieved 24 May 2006. ^ a b Allen, Katie (17 March 2015). "New 12-sided pound coin to be unveiled ahead of budget announcement". The Guardian. Retrieved 18 March 2015. ^ a b c "1p Coin". British Royal Mint. Archived from the original on 27 April 2006. Retrieved 23 May 2006. ^ "Royal Mint unveils new coinage portrait of the Queen". BBC News. 2 March 2015. Retrieved 18 March 2015. 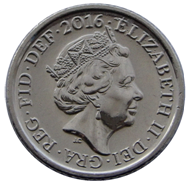 ^ "The reveal of the Queen's fifth coin portrait". Royal Mint. 2 March 2015. Retrieved 18 March 2015. ^ Royal Mint. "Why does the edge inscription on the £2 and £1 coins sometimes appear "upside down"?". Archived from the original on 4 November 2016. Retrieved 2 November 2016. ^ "History of the Royal Mint". 24carat.co.uk. Retrieved 9 April 2008. ^ a b "The New One Pound Coin". royalmint.com. 19 March 2014. Archived from the original on 19 March 2014. Retrieved 19 March 2014. ^ a b "Decimal coins issued £2 – 20p". The Royal Mint Limited. 2016. Retrieved 16 June 2016. ^ a b "New coin designs for 2014 unveiled by The Royal Mint". BBC News. 31 December 2013. Retrieved 21 January 2014. ^ "Decimal coins issued up to 31 December 2015 £2 - 20p". The Royal Mint. Retrieved 28 March 2017. ^ a b "Decimal coins issued up to 31 December 2015 £2 - 20p". The Royal Mint. Retrieved 6 August 2017. ^ "2016 One Pound | Check Your Change". www.checkyourchange.co.uk. Retrieved 28 March 2017. ^ "2013 Dated UK Collector Coin Sales". The Royal Mint. Retrieved 28 March 2017. ^ a b "The Last Round Pound 2016 United Kingdom £1 Brilliant Uncirculated Coin". The Royal Mint. Retrieved 9 June 2016. ^ "2016 One Pound". www.checkyourchange.co.uk. Retrieved 28 March 2017. ^ Powell, Anna (16 May 2016). "Behind the design: the last 'round pound'". The Royal Mint blog. The Royal Mint. Retrieved 19 October 2016. ^ Anthony, Sebastian (28 March 2017). "New "impossible" to fake £1 coin enters circulation today". Ars Technica. Retrieved 3 April 2017. ^ "Mintage figures". The Royal Mint Limited. 2018. Retrieved 21 September 2018. ^ Clive Kahn (17 December 2012). "43.5 Million Fake Pound Coins in Circulation". BusinessReport. ^ Josie Ensor (1 April 2012). "Three pound coins in every 100 are fake". London: The Telegraph. ^ a b Rosie Murray-West and Harry Wallop (27 July 2010). "Record number of fake £1 coins could force reissue". London: The Telegraph. ^ Chris Irvine (29 January 2009). "One £1 coin in 40 is a fake". London: The Telegraph. ^ a b Ben Ando (8 April 2009). "Fake £1 coin estimate 'doubled'". BBC News. ^ Sarah Preece (28 July 2010). "£1 coin under threat". London: Live Odds and Scores. ^ a b The types of counterfeit one-pound coins and identifying them. coinauthentication.co.uk. February 2006. Retrieved 24 January 2016. ^ "Report on UK £1 counterfeit survey" (PDF). Royal Mint. May 2009. ^ Svenja O'Donnell (18 March 2014). "U.K. to Replace 1-Pound Coin With Secure 12-Edged Design". Bloomberg. ^ Morley, Katie (28 March 2017). "Revealed: the secret code embedded on the Queen's face on new £1 coin". The Telegraph. Retrieved 12 September 2018. ^ "Letter From London: Real Britannia". The New Yorker (paid registration required for the full article).